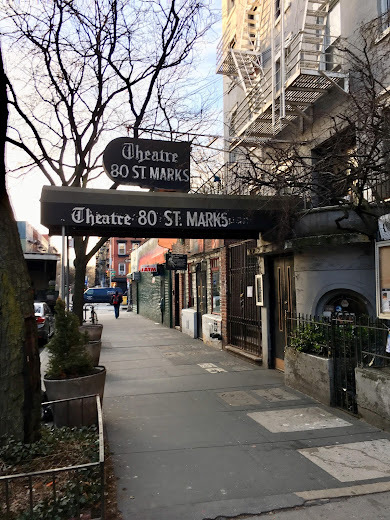 members of the staff at Theatre 80 on St. Mark's Place recently launched a crowdfunding campaign to help keep the enterprise alive. From prohibition speakeasy to beloved Off Broadway playhouse, Theatre 80 St Marks is a beacon of historical and cultural significance in the East Village. But maintaining, restoring and preserving the historic site with ever-escalating costs in a gentrifying neighborhood is challenging and expensive. Theatre 80 is one of the last surviving family owned and operated Off Broadway theaters, occupying two beautiful and historic 1830s townhouses, which along with a 199-seat theater includes The William Barnacle Tavern, Sidewalk Of The Stars and The Museum of The American Gangster. Theatre 80 has relied on generous contributions from patrons and friends to help bridge the gap in the past, and once again we are reaching out to the community for help. Theatre 80 is dedicated to making performing arts more accessible to both audience members and artists and a huge variety of performers and production companies have made Theatre 80 their artistic home. You can find more info on the campaign here. In the name of arts (or absinthe, or hot dogs, or anti-development) chip in a few clams! Everyone send some money, that's all. I'm sending what I can. A special place. What about a restoration grant for a historical place like this? "Where are all the big name artists and performers here and abroad with exceedingly deep pockets and an even greater sense of "historical and cultural" largesse who'll save the day?" That's a great question. This could also apply to the shutdown of Sunshine and Lincoln Plaza cinemas. In the past decade and probably in the last few years, A lot of actors and actresses and singers who act have decided to call Manhattan and Brooklyn home and have done some real estate dealings and profiting off their luxury digs to boot (J LO, Jessica Chastain, Michelle Williams, and Ms Swift come to mind). And of course all these movie producers who have saved a bundle filming in NYC thanks to generous tax abatements by the state. These moneyed individuals can just take a wad of bills out of their designer purses or their pied-e-terre safes and can keep these cultural landmarks in the black for a while. They have a "mentalist" show (I think it's here) that looks like fun and I want to go to.